Pop.448. In the Reg. Mun. of Durham, on Hwy 7 and C. Rd. 2, 24 km. SW of Lindsay. The first settler was S. Patterson who came in 1827. The place was first called Ham's Corners because Jacob Ham had the first log store. Pop. 92. In Eldon T., Victoria C. at the junction of Hwys. 8 and 46, 13 km E of L. Simcoe. Pop. 92. In Victoria C. on C. Rd. 46, 30 km W of Lindsay. Pop. 719. In Mariposa and Eldon Ts., Victoria c., on a branch of the Beaverton R. and C. Rds. 2, 9 & 46, 27 km. W of Lindsay. Pop. 372. 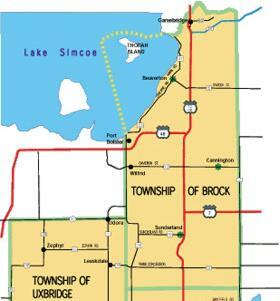 Part ofScugog T. in the Reg. Mun. of Durham, on C. Rd. 2,37 km N of Whitby. Pop. 2,018. In Brock T., Reg. Mun. of Durham, on the Beaverton R. and on C. Rd. 12 between Hwy 7 & 12 & C. Rd. 2, 58 km. NW of Oshawa. Pop. 600. In Scugog T., Reg. Mun. of Durham, on the E shore of L. Scugog and C. Rd. 57, 32 km N of Oshawa. Pop. 566. In Manvers T., Durham C., on McDermid's Cr. and C. Rd. 5, 32 km SW of Peterborough. Pop. 79. In Brock T., Reg. Mun. of Durham on the Beaver R., and Hwys. 7 &. 12,37 km SW of Lindsay. The place is shown on an 1875 map and the post office opened in 1887. Pop. 73. In Reach T., Ontario C. on Hwy 7 & 12 and C. Rd. 6, 12 km. NW of Port Perry. The earliest reference to the community is on an 1860 map. The history of the community and the origin of its name have not been recorded. Pop. 53. In Brock T., Reg. Mun. of Durham on C. Rd. 2 between C. Rds. 4 & 28, 18 km N of Port Perry. The place first appears on an 1860 map, but neither its history nor the origin of its name have been recorded. Pop. 1,082. In the Reg. Mun. of Durham on the Beaverton R and Hwy 7 & 12 and C. Rd. 10, 85 km NE of Toronto. Open 9am-4pm Sat.&Sun. Enjoy bedraces,entertainment, street vendors, arts & craft show.